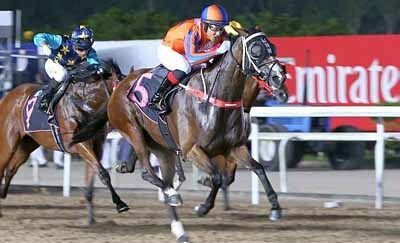 Newly-licensed apprentice Abu Bakar Riduan was off the mark in his first day at the office when he partnered VENUS DE MILO to victory in the Class 5, Div 2 - 1600m handicap on the polytrack at Kranji here tonight. The Kelantan-born lad gave glimpse of what was to come when he finished third in his Singapore debut when third on SUCCESS COME TRUE two races earlier. Riduan then made no mistake with VENUS DE MILO when the pair came from midfield to win by three-quarter length for the mare's second win in 29 starts. Riduan honed his skills in New Zealand where he rode 13 winners from 62 rides. "In the last two years, I’ve been dreaming about riding in Singapore and tonight, it’s become reality," said Ruduan. "I’m very happy I got my first Singapore winner."